I have concluded that my taste preferences must be going through some sort of mid-life crises. Or how does one explain the subtle but sudden changes in my taste preferences? Like my new-found love for bitter? Or baked over pan-fried? Talking about pan-frying, I have been a big fan of pan-searing salmon on high heat for a long time. And that’s because I am a sucker for that crispy crust that searing on high heat yields. Plus, it’s super super easy to pan-fry, and old habits do die hard… Truly. But not so long ago, I plucked the courage to take the plunge and give baked salmon a go. And I am hooked for so many reasons, but most of all, because the gentle heat from baking gives the salmon that irresistible tender, buttery and melt-in-your-mouth texture. I am now a baked salmon kinda girl…at least for now. Now imagine topping that with this incredibly simple but potent glaze… deep breath. 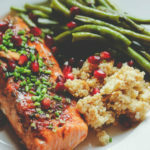 A great salmon glaze has got to be oozing with these three qualities; an incredibly shiny appearance, a to-die-for flavour and that deep brown caramelised crust that leaves one drooling at first sight. I am glad to report that this easy-to-make glaze has all three qualities in excess. This glaze is the perfect blend of sweet and savoury – thanks to the garlic, ginger, honey and juice of blond oranges. My little ones don’t do spicy very well, so I omitted those, but if you want to dial up the heat factor just a bit, you can add the flesh of a scotch bonnet pepper. It doesn’t get simpler. All you need for this glaze are 5 ingredients, and 20 – 30 minutes to reduce and caramelise. 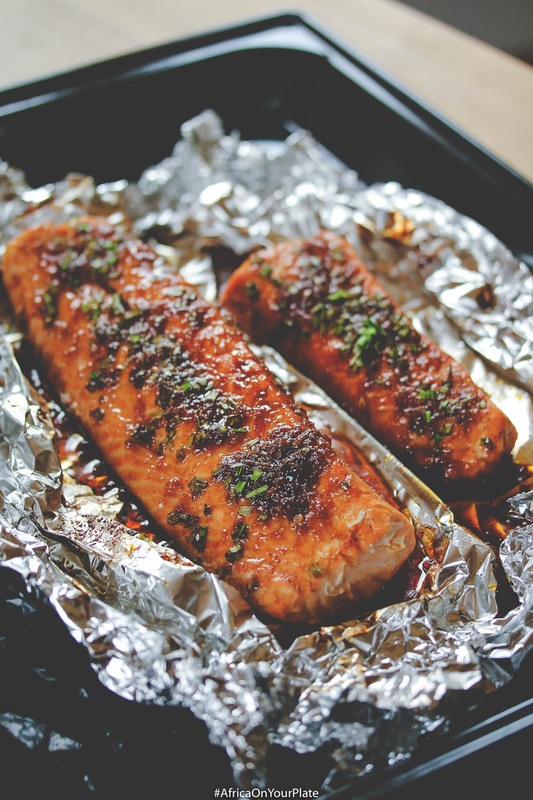 As for the salmon, all you need is a sturdy baking pan, and a sheet of foil. 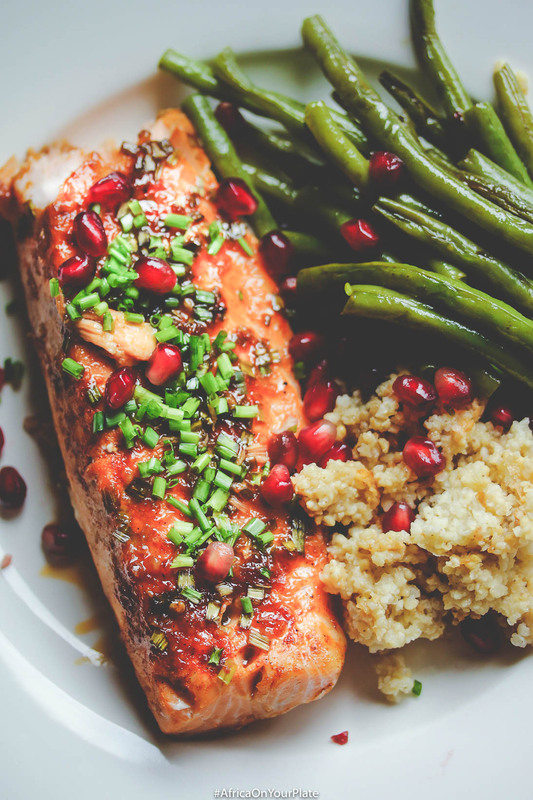 Top with some pomegranates for that extra dose of anti-oxidants, and serve with steamed millet and green beans…or whatever catches your fancy. Et voila. 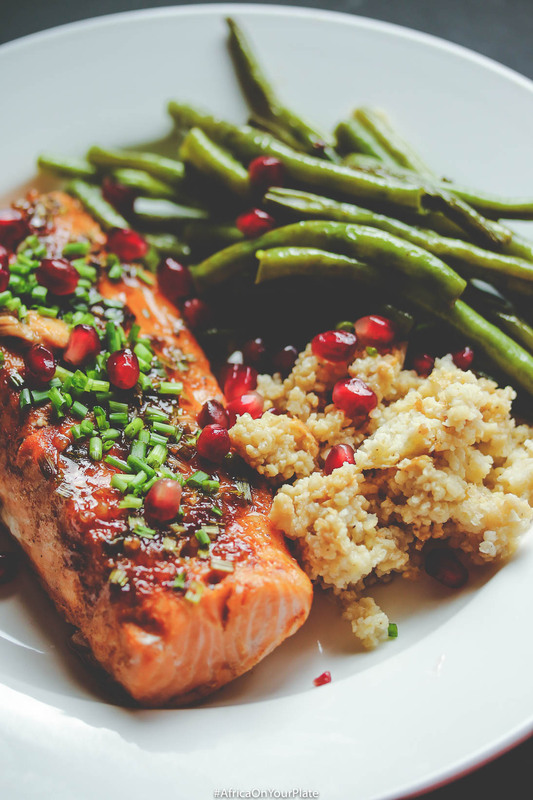 The perfect baked honey and blond-orange glazed salmon. Mix all the glaze ingredients together in a pan. Bring to a boil on medium to high heat. Then reduce heat to medium and simmer, stirring frequently, for 20 - 30 minutes or until the glaze is fully reduced. Preheat your oven to 180 degrees centigrade (fan-assisted) or 200 degrees (not fan-assisted). Place the salmon fillet on a sheet of foil and then brush the olive oil over the fish. Ensure that the sheet of foil is large enough to form an envelope around the fish fillet. Sprinkle the fish seasoning and the chopped dill over the fish. Reserve some of the chopped dill for garnishing later. Wrap the foil around the fish leaving a slight opening at the top to let the steam escape. Bake for 10 minutes. Then remove from the oven, and brush the honey glaze liberally over the fish. Return to the oven and bake for a further 10 minutes. Looks like a recipe I’ll need to try out asap! Great recipe, looks tasty. I have been trying to add more healthy fish into my meal plans.